"What a positive effect a female role model can have on girls' education." "We celebrate the next generation. They are important. There is hope. They can survive. Let's provide strong values to support them." 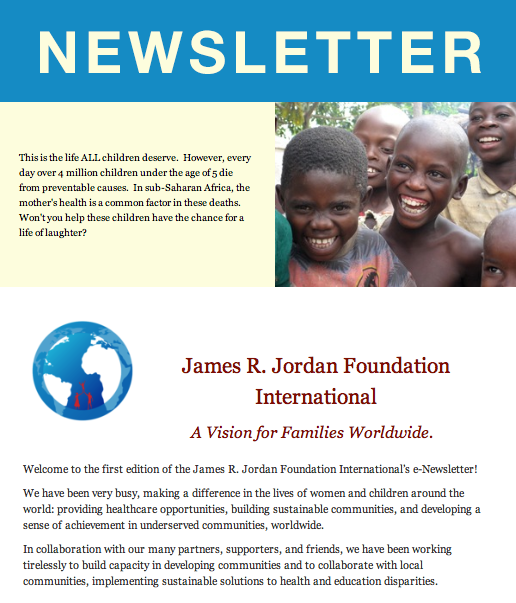 James R. Jordan Foundation International (JRJFI) is committed to building capacity in developing communities worldwide. Collaborating with local communities, we implement sustainable solutions to health and education disparities by connecting local challenges with global partners. JRJFI heeds the call to help heal. We acknowledge our duty to share resources. We understand the financial investment it takes to empower a strong people with sustainable infrastructure. We are committed to our responsibility for the global community. We commit to ending gender-based violence. We commit to increasing the number of students receiving an education. We commit to building the capacity of healthcare providers. We commit to raising awareness of the women and children suffering from violence. The Kenya Women and Children's Wellness Centre is the inaugural project of JRJFI, set for construction in Nairobi, Kenya. The Wellness Centre was developed in response to three critical shortages in the country: lack of access to health care providers; lack of access to treatment and medicines; and lack of affordability. For more information on the Wellness Centre and on how you can be a part of the project, visit our Give page. It is through the generous donations of our friends and supporters that we are able to continue to promote healthcare and education initiatives for the women and children of East Africa. We thank you for your continued commitment. Click today to join us in this endeavor!